THERE’S A PHOTO of a bright-eyed baby in a knitted owl toque. Another shows a toddler plunked down between Halloween pumpkins. And then there are the awkward smiles of the first school portraits. The charming snapshots posted in the Manitoba lab of the Canadian Healthy Infant Longitudinal Development (CHILD) Study offer a glimpse of how the study’s 1,000 local participants are growing from infancy into their elementary years. The research project is one of the world’s largest birth-cohort studies of the origins of allergy and asthma. The oldest children are now eight years old. More than 40 researchers across Canada, members of the Allergy, Genes and Environment Network, have been following them since before they were born. Among the valuable samples collected: their first dirty diapers and their mothers’ breast milk. Azad, assistant professor of pediatrics/child health and community health sciences in the Max Rady College of Medicine, holds a Canada Research Chair in developmental origins of chronic disease and is a research scientist at the Children’s Hospital Research Institute of Manitoba. She is breaking new ground with her findings on how breast milk affects a baby’s gut flora. 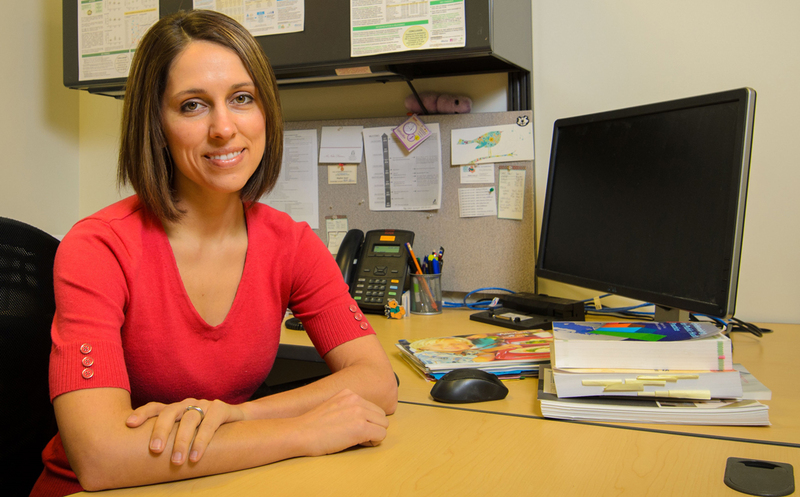 She believes the complex interactions between microbes in a mother’s milk and her baby’s gut microbiome (the bacteria in the digestive tract) influence the immune system, possibly explaining why a growing number of North American kids need EpiPens and inhalers. Our gut microbiome trains our immune system to distinguish between normal, friendly bacteria and bacteria that make you sick, Azad explains. “We don’t fully understand how these millions of microbes develop in the bellies of babies, and how they influence our health,” she says. Her team is studying components of breast milk, including probiotic bacteria, food antigens, immune factors and prebiotic sugars. They are comparing this data with health outcomes of the CHILD Study participants over time to better understand how breast milk protects against allergy and asthma, as well as obesity and diabetes. So far, the findings show a link between a specific profile of complex sugars in breast milk – known as oligosaccharides – and a lower rate of food sensitization during infancy. These bioactive molecules feed good bacteria. Azad and her CHILD colleagues also discovered a different bacterial composition among breastfed babies who were supplemented with formula, compared to those exclusively breastfed. Another of their studies revealed that breastfed babies have a reduced risk of becoming overweight by their first birthday. The scientist wants to know more, such as whether pumping breast milk and feeding it from a bottle imparts the same health benefits as feeding directly at the breast. Azad, who was raised in Winnipeg, was a child with asthma herself. As a 10-year-old, she took part in a U of M-led study of a new asthma drug. She grew up to complete a bachelor’s degree in biochemistry and a master’s in epidemiology before earning her U of M doctorate in biochemistry and medical genetics. That was followed by postdoctoral work in pediatrics at the University of Alberta. She has a strong interest in studying patterns of health at the population level. The U of M has a unique resource that makes it an ideal setting for that type of research: the Manitoba Centre for Health Policy, which houses a rich repository of anonymized data. Student Deborah Chan and Dr. Meghan Azad in the CHILD Study lab. “They have administrative data from everyone in the whole province of Manitoba, including hospital records, prescription records, physician billing records and education records. From that, we can do really powerful studies with the whole population,” Azad says, noting that breastfeeding data will soon be added to this list, facilitating research that is not possible anywhere else in the world. Azad is the co-lead for population health in the Manitoba Developmental Origins of Chronic Diseases in Children Network (DEVOTION). She and fellow DEVOTION researcher Dr. Nathan Nickel are establishing a new breastfeeding research program: the Manitoba Interdisciplinary Lactation Centre, or MILC. She is endlessly fascinated by the powerful properties of mothers’ milk. The first feeds after birth, she says, have higher concentrations of antibodies and oligosaccharides, which help kick-start the baby’s immune system and establish friendly gut bacteria. Breast milk’s components change over the course of a day (nighttime milk contains tryptophan to help the baby sleep) and even over the course of one feeding (the end of a feed has a higher fat content to signal to babies that they’re full). “Human milk is the ultimate personalized medicine,” the scientist says.